Synopsis: Tessa is sixteen years old and terminally ill with leukemia. In the last few months before she dies, she makes a list of all the things she wants to do before her death. Tessa is your average sixteen year old girl. She's smart, witty, and the list that she compiles before her death is exactly what you'd expect from a sixteen year old: get a boyfriend, lose her virginity,fall in love, become famous. She asks her best friend Zoey to ensure she carries out the list no matter what. Her divorced parents struggle to accept that their daughter will die soon, while her younger brother Cal is cheerful and matter-of-fact about the situation. The characters in this book are amazing. Although Tessa is only sixteen, being terminally ill with leukemia has made her wise beyond her years. She has trouble accepting her death at times, and feels older than her parents as they struggle to do so. Her mother, who abandoned her until very recently, is clueless about how to look after Tessa while her father is desperate, searching for any cure that can save his daughter. She falls in love with her next door neighbour Adam, and their relationship is a complex one. Part of her desperately wants Adam and their love to save her, which she knows is ultimately impossible. Although he loves Tessa, Adam finds it hard to be there for her in the way she wants him to. He is brave- he knows that her death will cause him a tremendous amount of grief yet he is there for her every step of the way, never holding back. Honestly, I found this completely heartbreaking- they had just found each other, they were tremendously happy together, yet they knew that their happiness could only ever be momentary as Tessa has only a few short months to live. Another fantastic thing about this book is Tessa coming to terms with her illness, and the way in which death is dealt with. Early on in the book, Tessa, Adam and Zoey go to the woods and take magic mushrooms. Tessa is desperate to be healthy and gets very excited in the woods and tells Adam she thinks it has cured her: "I'm not sick any more...I need to stay here in this wood. I need to stay away from the modern world and all its gadgets and then I won't be sick. You can stay with me if you want..We'll grow vegetables". I had tears in my eyes at this point- she had an early death sentence pronounced on her which she tried, but ultimately could not escape. Later on she is angry with everyone, that they'll go on living while she'll be buried underground. 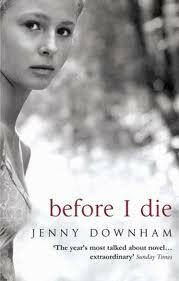 As the book progresses and Tessa gets weaker and weaker, her thoughts become more fleeting and she sees death everywhere. The book literally ends on the moment when she dies. This is a truly extraordinary, unforgettable book. It took a while for me to get into the book, but once I did I was hooked! Downham's book is touching and well written; although it deals with a fairly unpleasant subject, it is ultimately an uplifting book. It is also a major tear-jerker! Overall an amazing book, and a well-deserved five stars. Discussion: What would be on YOUR list of things to do before you die? I am definitely putting this down as a book to purchase. I'd want to take a trip somewhere I'd never been. At 16 I hadn't been to Europe so I'd want to see London and Paris and Rome. Now I'd want to take a trip to Australia with friends and family. Although, that would all depend on money and if I felt ok enough to travel. But it is something to think about. Oh man, this sounds like a book that will rip me from the inside out emotionally. I have it on my TBR list - thanks for the fantastic review. My fiance heard me talking about You Against Me and how much I want to read it, so he ordered from the UK for my b-day :) I should get it later this month - can't wait! So moving (I was in tears at the end-when she addressed her family) and yet in a strange way uplifiting all at the same time. I thought Tessa was a brilliant character. I think I might have to add this to my to-read list! This sounds like an amazing book. Even though it seems like a sad book, I love books like these. The type where the characters are amazing and the book makes you FEEL emotions! That's what makes a good book. I added this to my TBR list. I may have to purchase it to read it faster than waiting for it from the library! I *loved* this book. When I reviewed it on LibraryThing, I suggested that the author might know the meaning of life. Love this site, and I'm glad that Margaret Atwood retweeted you guys! Finished reading this a read a month or so back, it is definitely a unforgettable book. Found myself crying in quite a few places in the book. I loved it as well and had to stop reading every 2 minutes because I was crying too much. Which doesn't happen to me that often (to cry reading a book yes but not to that extend). Read her 2nd book, still well written. Liked it all right but prefered this one.